here is boot from terminal connected trough serial debug: Uncompressing Linux… done, booting the kernel. 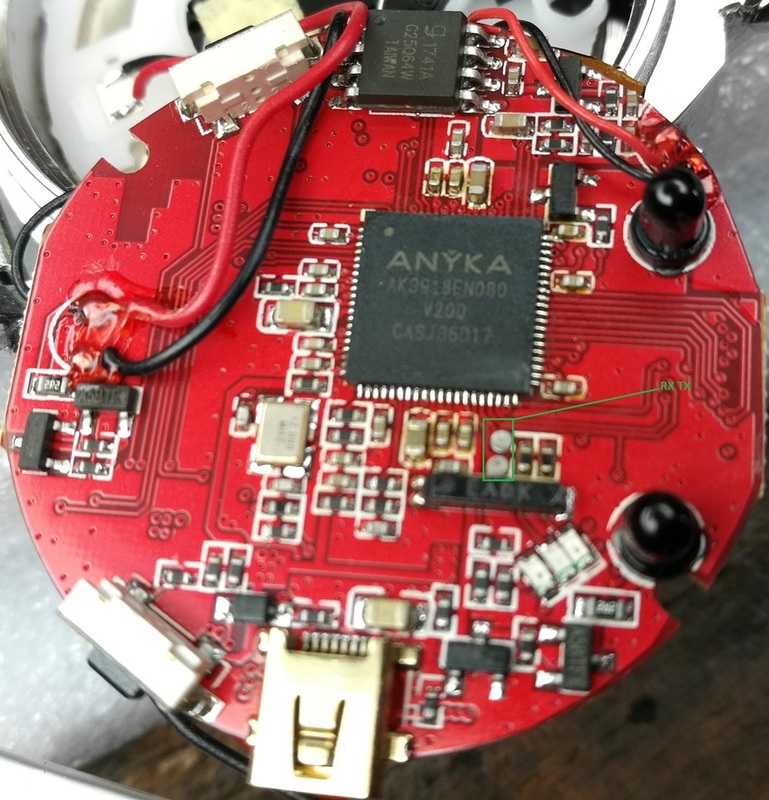 Anyka platform share gpio locks initialize. akfha Char Device Initialize Successed! jffs2: version 2.2. © 2001-2006 Red Hat, Inc.
ion: failed to create debug files. akpi regs: SPICON:00000152, SPISTA:00000015, SPIINT:00000000. Init AK SPI Flash finish. akspi master initialize success, use for DMA mode. battery:cap=19; vol=3633; status=discharge; full=0; poweroff_cap=0; low_cap=5. akmci ak_mci: Mci Interface driver.mmc0. using l2dma, sw IRQ. detect mode:GPIO detect. akmci ak_sdio: Mci Interface driver.mmc1. using l2dma, hw IRQ. detect mode:plugin alway. VFS: Mounted root (squashfs filesystem) readonly on device 31:1. Did you manage to recover this camera? I managed to get the nanddump if you’d want it to fix your device. 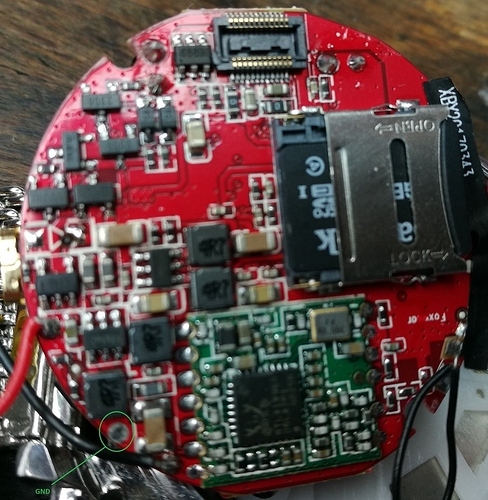 is there a way you could create a dump of your firmware so I could try to compare those 2? No I was not possible to recover it, because I am in some read only mode probably, connected trough serial console. I can only see the boot process and that is all. can you see a login prompt? can you login to the console over the serial? you might try removing the SD card and try to boot again - my SD card broke and was causing the boot to fail. but if there’s a chance you can get the shell it’s easier that way. No I can’t see login prompt from console, but I think there is probably possible to switch from read to write mode over the serial console connection but can’t figure out how? Or I am connected trough the debugging interface and this can interact as read only? I tried boot even without microsd card and also connected microsd card reader trough usb otg with no progress. If you are sure that it is possible dump and program it from the SPI chip, and you are sure that is it really Serial Peripheral Interface chip I would try to get some programmer or build it if you have advice how to or where buy it cheap , because it would be possible to solder on it cables, the whole things are so small But I cant find info about that chip when googled, neither 1741A or G25064W, how should I figure out the pins? the g25q64 chip is a well-known chip and it’s supported by this programmer. I try find out what next to do with the dd extract on internet, but I would appreciate your help if you know it better then me? 196085 0x2FDF5 BFF volume entry, file size: 586812452, compressed size: 376301591, file name: “NÎPºä” #"
252783 0x3DB6F BFF volume entry, compressed, file size: 1564437514, compressed size: 1108485024, file name: " !¾vÐ0M3"|"
461733 0x70BA5 BFF volume entry, file name: “à#àÿÁãÁðÁ<ãQ\á@ñ]L^mÐ"Ü±”}gâ/D¬kì·ì¶l"
477033 0x74769 BFF volume entry, AIXv3, file size: 56021522, compressed size: 1090228503, file name: “ÍLp@J^s`|m!×È|#\”^îÒd}W$l×"
894450 0xDA5F2 Certificate in DER format (x509 v3), header length: 4, sequence length: 8622 9ÕL"JÍÍ|ÝÍ]½M"
913711 0xDF12F BFF volume entry, compressed, file size: 8777994, compressed size: -1845080638, file name: “»(”]ZL_ e"
1031270 0xFBC66 BFF volume entry, AIXv3, file size: 1815617813, compressed size: 132334942, file name: “^, ¿”"
1039311 0xFDBCF BFF volume entry, AIXv3, file name: "$W "